A seafood-focused restaurant from Animal chefs Jon Shook and Vinny Dotolo. : Chefs Jon Shook and Vinny Dotolo are behind Son of a Gun, which focuses on local and seasonal American seafood. The tiny dining room is decorated with nautical items, fishing gear and antler taxidermy (perhaps the latter is a nod to their other restaurant, Animal?). 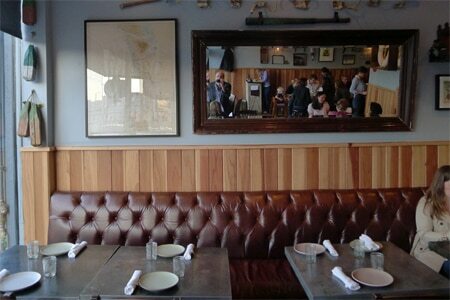 The 55-seat space is half occupied by a long communal table for walk-ins. Prepare to feel a bit crammed and jammed. The daily-changing menu lists small plates that are meant to be shared. Dishes can be hit or miss. Pass on the over-salted Benton's country ham and hushpuppies in favor of the amberjack crudo, galbi vinaigrette and Asian pear. Also recommended are the Dark Knight carrots with green goddess, chili oil and watercress, the chefs’ version of a lobster roll and the octopus confit salad with mirepoix and chili. Further down on our list was the linguine and clams, which would have benefited from more (and fresher) bivalves. For dessert, opt for the refreshing deconstructed Key lime pie composed of frozen lime yogurt, graham crumble and toasted meringue. The beverage list features boutique wines, craft beers and classic cocktails.